Dr. Offerle provides primary eye care for patients of all ages, including eye examinations, contact lens fittings, ocular health diagnosis and treatment, and optical services. Dr. Offerle has developed a great interest in serving patients who have limited visual potential. She finds it professionally rewarding to provide low vision patients with tools to enhance their remaining sight. While at the Indiana University Optometry School she completed several clinical rotations including at the school's clinics in Bloomington and Indianapolis, at Eye Surgeons of Indiana, and at the VA Clinic of Northern Indiana. Although she is the newest member of our professional staff, she has served the patients of Eye Care Associates of Michiana many years prior to becoming an optometrist in the capacity of clinical technician, receptionist, and optician. Her early exposure to the practice – including shadowing her father Dr. John Offerle – influenced her change in career plans from orthopedic medicine to optometry. Dr. Offerle annually provides free vision screenings to area schools and is a member of VOSH (volunteer optometric service to humanity). She traveled with her father, Dr. John Offerle, on a VOSH mission trip to Honduras where they provided free eye care to patients who would not otherwise have access to quality eye care. She has volunteered for the Indiana Optometric Association's "See to Read" program at the St. Joseph County Public Library. 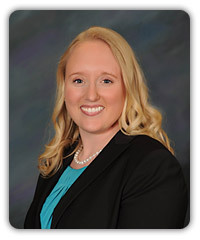 Dr. Kristina Offerle received her Bachelor of Science from Indiana University, and her Doctor of Optometry from Indiana University School of Optometry. As an optometric student, Dr. Offerle was selected as an assistant instructor for Ophthalmic Optics and was accepted as a member of the Beta Sigma Kappa Optometric Honor Fraternity. Her commitment to progressive eye care is demonstrated by her regular attendance at continuing education seminars and conferences. Dr. Offerle is a member of the Indiana Optometric Association, Volunteer Optometric Services to Humanity (VOSH), and South Bend Kiwanis Club where she will serve on the executive board. As her practice grows, she looks forward to continuing the doctor tradition of Eye Care Associates of Michiana by assuming more active roles in professional groups. Dr. Kristina Offerle was born and raised in South Bend, Indiana. She graduated from Marian High School in Mishawaka, where she met her husband Chris Nowak. Chris attended Ball State University and is a teacher at LaPorte High School. They were married in June 2011, and reside in South Bend, Indiana.